Faculty of Science, Zanjan University, Zanjan, Iran; 3Department of Geology, Faculty of Science, Zanjan University, Zanjan, Iran. tained results when compared with WHO and USEPA standards show a very high concentration of some toxic metals. 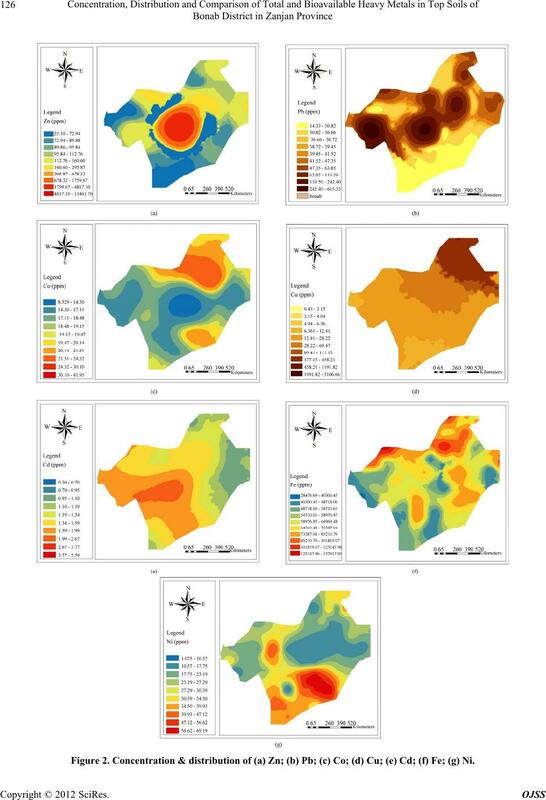 the district notably Zanjan city indicating its anthropogenic origin. considered as a traditional mining region since antiquity. viding the grid in selected locations (2.2 km grid). taken to the laboratory for pre-treatment and analysis. with distilled water after each sampling . and were air dried at ambient conditions for two weeks. ethylene bags and re-homogenized before being used. standard methods (the aqua regia digestion method) . and the solution heated to boiling point for 2 hours. then filtered through using a Whatman (No. 42) filter. Figure 1. Location map of the studied area indicating sampling points. tal distribution maps were drawn. 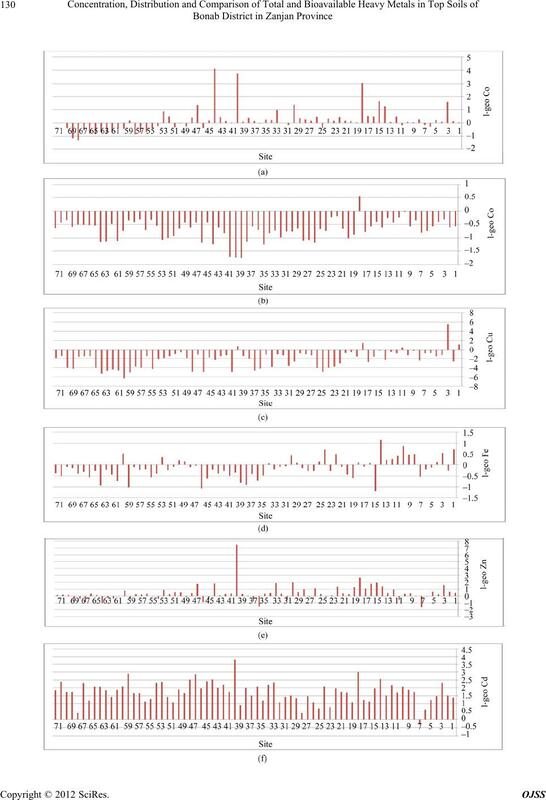 is quite variable ranging from 248 to 1721 µs·cm–1. der of Fe > Zn > Cu > Pb > Ni > Co > Cd. 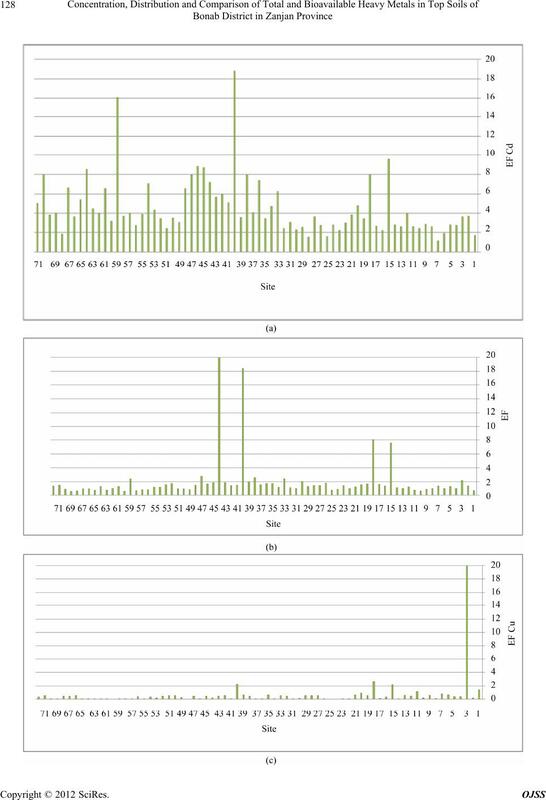 correlation between them, (Table 3). gasoline and also may by air borne (Figure 2(b)). Table1. The nature of the soil samples and total metal concentrations in the top soil (mg·kg–1). Table 2. Metal concentrations were compared with existing standard (mg·kg–1) . 1United State Environmental Protection Agency; 2Great London Council. Table 3. 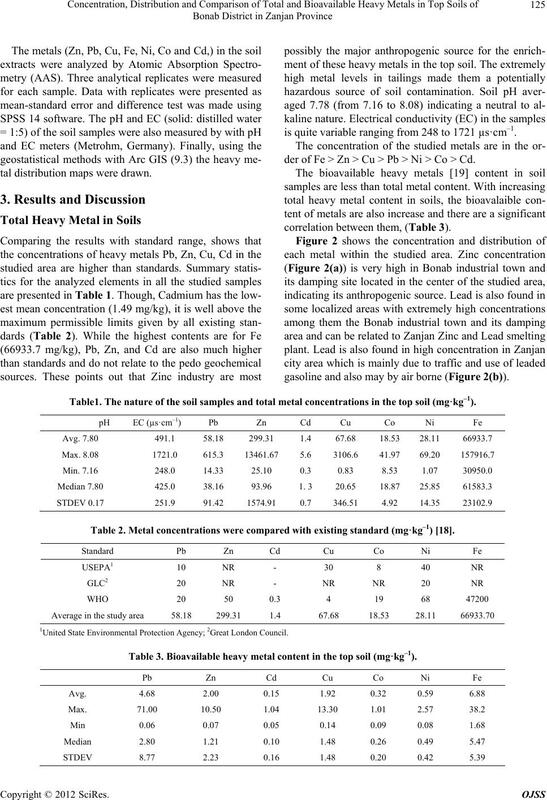 Bioavailable heavy metal content in the top soil (mg·kg–1). Figure 2. Concentration & distribution of (a) Zn; (b) Pb; (c) Co; (d) Cu; (e) Cd; (f) Fe; (g) Ni. of the studied area (Figure 2(g)). tration present in the reference station or material [21,22]. metal and normalizer in sediment and in unpolluted soil. EF > 40 is extremely high enrichment. (d), Zn (e), and Ni (f) in the study area. be attributed to lithogenic variations in the sediment . merical value of the index as follows: . Igeo ≥ 5 means very strongly polluted. and Ni (g) in the studied area. Figure 3. 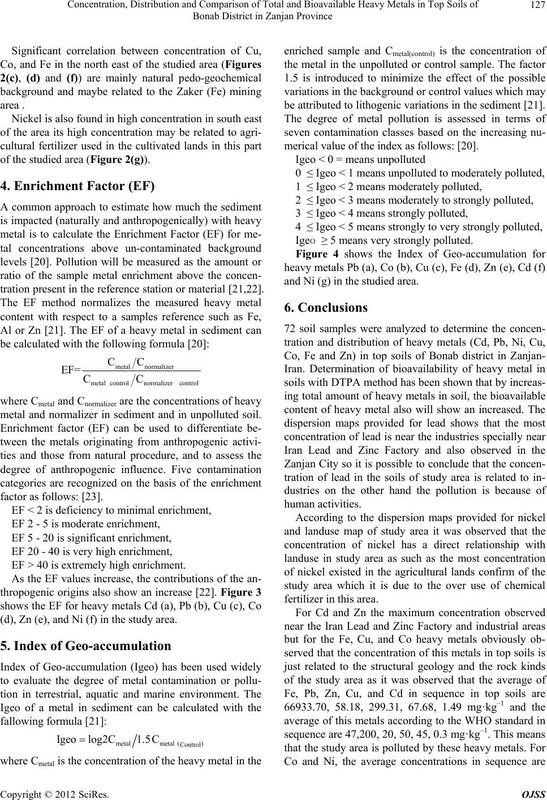 Enrichment Factor (EF) for heavy metals Cd (a), Pb (b), Cu (c), Co (d), Zn (e), and Ni (f) in the study area. Figure 4. Index of Geo-accumulation for heavy metals Pb (a), Co (b), Cu(c), Fe (d), Zn (e), Cd (f) and Ni (g) in the study area. these metals are 68 and 19 mg·kg–1 respectively. No. 2, 2003, pp. 147-163. No. 1-3, 2002, pp. 1-32. 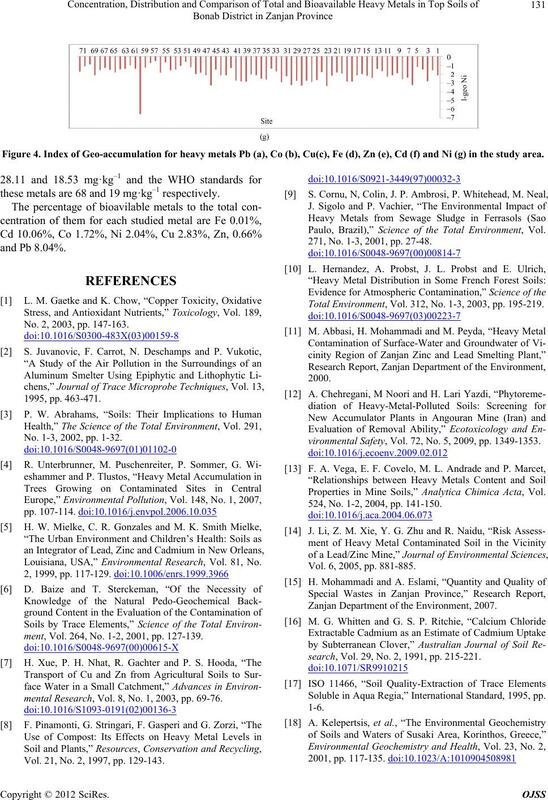 Louisiana, USA,” Environmental Research, Vol. 81, No. ment, Vol. 264, No. 1-2, 2001, pp. 127-139.
mental Research, Vol. 8, No. 1, 2003, pp. 69-76. Vol. 21, No. 2, 1997, pp. 129-143. 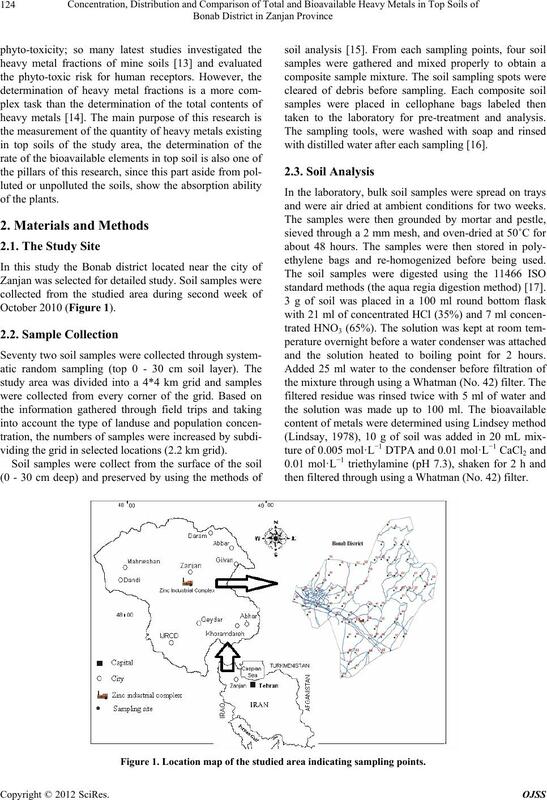 Paulo, Brazil),” Science of the Total Environment, Vol. 271, No. 1-3, 2001, pp. 27-48. 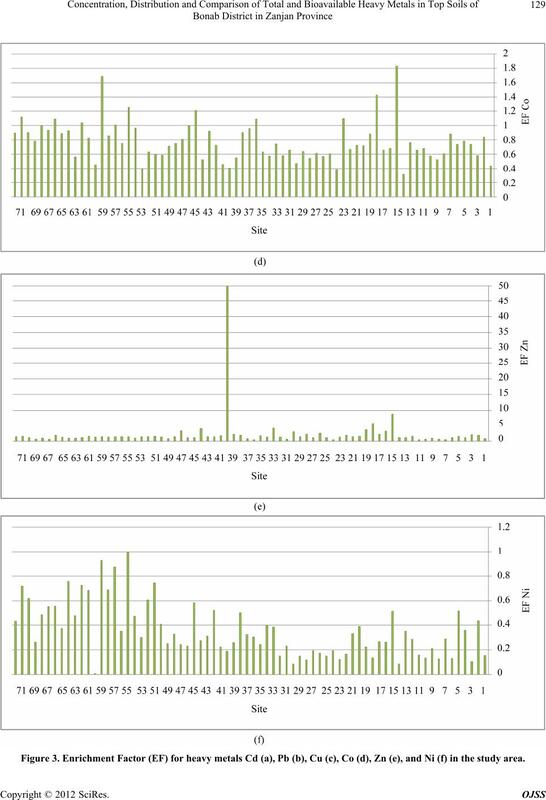 Total Environment, Vol. 312, No. 1-3, 2003, pp. 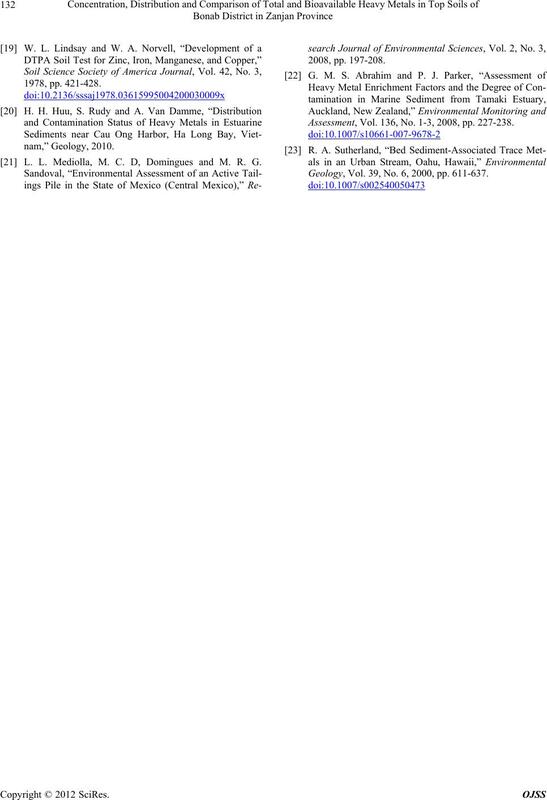 195-219.
vironmental Safety, Vol. 72, No. 5, 2009, pp. 1349-1353. Properties in Mine Soils,” Analytica Chimica Acta, Vol. 524, No. 1-2, 2004, pp. 141-150. Vol. 6, 2005, pp. 881-885. 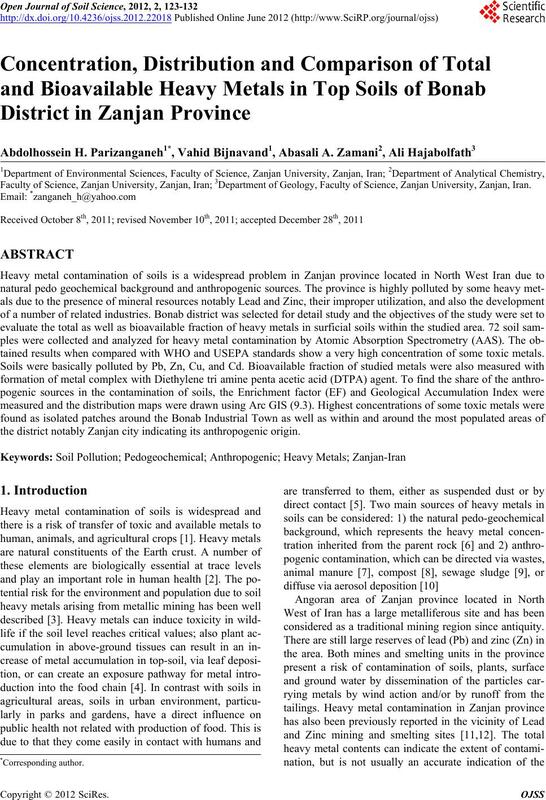 Zanjan Department of the Environment, 2007.
search, Vol. 29, No. 2, 1991, pp. 215-221. Soluble in Aqua Regia,” International Standard, 1995, pp. L. L. Mediolla, M. C. D, Domingues and M. R. G.
Assessment, Vol. 136, No. 1-3, 2008, pp. 227-238. Geology, Vol. 39, No. 6, 2000, pp. 611-637.